It's been a weird month for cereal: First movie-theater candy got transformed into breakfast, and now two classic truck-stop snacks are getting the same treatment. After taste-testing Post’s Sour Patch Kids cereal and seeing the heated reactions to it, I figured there’s no way Post would go back to just making Grape Nuts for your meemaw and/or peepaw. 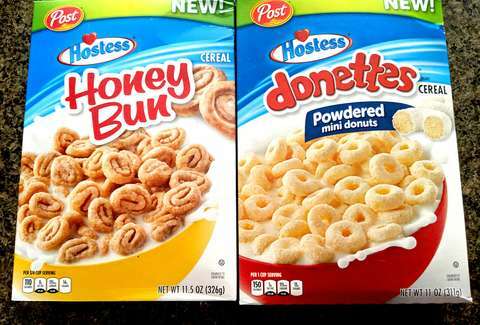 And sure enough, those morning-time maniacs upped the ante and released cereals based on two of the most popular Hostess snacks: Donettes and Honey Buns. (I’m calling it now: A Twinkies cereal can’t be far behind.) These cereals are designed to give you all the flavor of your favorite convenience-store breakfast, but in bowl form. I had to try them. Here's how they stacked up. If you haven’t had Donettes in a while, here’s a refresher. They’re tiny, thick, little yellow cake donuts covered in powdered sugar. I hadn’t had a Donette in a hot minute, so I ate one. To be honest, the hot minute was the length of my entire life until the present. You see, growing up in the Philadelphia area, I was a devoted Tastykake man. That five-star company has its own line of adorable powdered donuts called -- get this -- Mini Donuts. But when I took a bite of those Donettes, I understood why they’re a Hostess staple: they’re bite-sized, delicious, and when you buy ‘em at the supermarket, you get at least 15+ in a bag. When I opened the Donettes Cereal box, I was pleasantly surprised. It smelled like cake batter! But I wondered how the company was going to replicate the donut’s soft, pillowy mouthfeel in cereal form. Bad news: if there’s a way to do this, Post hasn’t figured it out. Can’t they just buy that shrink ray from late ‘80s-era Rick Moranis or something?! Instead, eating the little corn-based mini-Donette cereal is like eating supersized Cheerios covered in powdered sugar. Which isn’t a bad thing, but it’s super crunchy, and you lose out on one of the best parts of an actual Donette: that glorious mouthfeel. But the sugary finish in the cereal is fairly reminiscent of the donut, so I’ll count that as a win. Because I can’t help myself, I dunked a Donette in a glass of milk to see if it tasted better than eating a bowl of Donettes cereal. It just makes the donut taste wet. Do not try this at home. Unless you like wet donuts! In which case, carry on! Freak. First, I had to reacquaint myself with the Hostess Honey Bun. Sorry, I had to acquaint myself because that Tastykake Honey Bun has long had my heart. Because my supermarket stupidly didn’t sell Hostess’s cinnamon-filled treat, I walked into a nearby convenience store about the size of a New York City apartment’s bathroom hoping to find one. Despite its size, the cashier helpfully pointed me to the Honey Bun. Success! After I tore the package open, my first bite was a great one, what with the honey bun’s lusty mix of honey and cinnamon notes, and a satisfying chew. When I opened the cereal box, I expected it to smell like a honey bun -- loads of honey and cinnamon. That smell must be hard to replicate, because this cereal smelled like watching someone eat a honey bun over FaceTime. As in, it didn’t smell like much except corn cereal with a dusting of honey. If you’re looking for the intensity of a real Honey Bun, this is not your bowl of cereal. Here’s the good news: the cereal has some honey and cinnamon flavors! There are serious Honey Nut Cheerios vibes in the finish -- it’s like they dusted those Cheerios with a bit of cinnamon and renamed it Honey Bun Cereal. Post also gets points for aesthetics -- I love the hundreds of miniature Honey Buns in every bowl. What’s better: the cereal or the real thing? 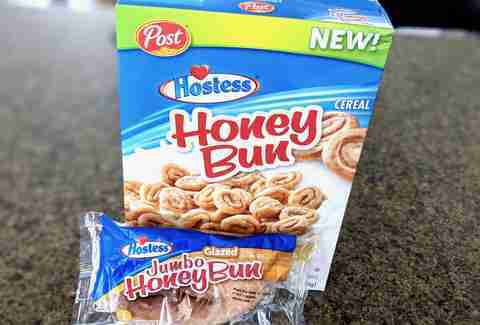 Both of the Hostess products are objectively better tasting than the cereal. You might’ve expected that, but whereas I have to tap out after a few bites of Honey Bun lest my body shut down from honey overload (not a real disease), I can easily put away an entire bowl of Post Hostess Honey Bun Cereal. That’s as high a compliment as I can give a bowl of cereal. Each spoonful makes you want to eat another spoonful. 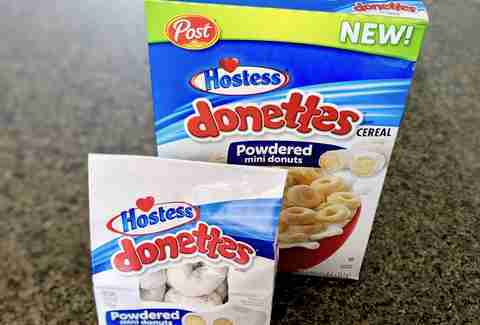 And the Donettes Cereal also scores points for anyone who loves little sugar-coated nuggets in their cereal bowl. Overall, Hostess and Post have two strong new entries into the cereal aisles. Only one question remains: when’re we getting that Twinkies cereal?